London Marathon 2016 – the best race on earth! 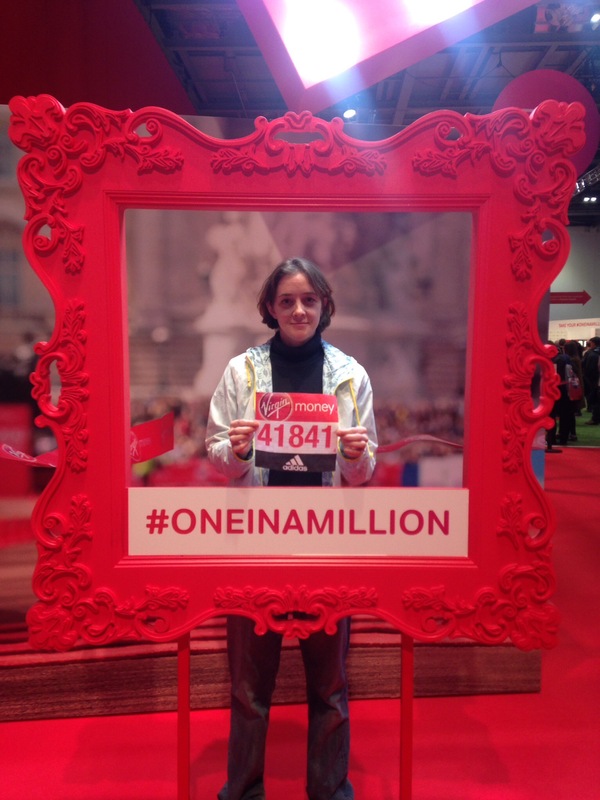 Officially my London Marathon time 2016 was 04.28.37…. So, after everything it was a fairly respectable time! That’s a million times faster than I thought it was going to be. My family, who were following on the marathon App apparently thought I set of like a bull out of a gate, but from my perspective is was steady all the way through until about mile 20 where I began to flag. The day dawned grey, drizzly and cold – you wouldn’t have thought a week or so ago we were hitting temperatures in London of near 20. I had a warming bowl of porridge and a steaming mug of coffee and headed to the bus stop. I met my first fellow marathoner getting on the number 48 for London Bridge, called Bal from Leeds running his first marathon. Then suddenly arriving a London Bridge Station there seemed to be an increasing number of people wearing running gear – albeit with a fair few layers on – and all with the same kit bag. Bal seemed relieved as I am not entirely sure that he was convinced I was showing him the right direction to go in – don’t know why he wasn’t convinced! Arriving at Greenwich it definitely felt cold and several local pubs were selling tea and bacon rolls. Bal & I headed into the park. Having not run the London Marathon for 8 years it has got some changes to the set up. There is more checking of your number before you go into the park, which only runners are allowed into, there are big screens up showing all the different starts as they happen, and there are improved (ish) loo facilities. I don’t know if any other race has started this, but female urinals is a first for me. Basically, there were two great big square canvassed rooms (without a ceiling), a female urinal and a men’s. At the entrance to the women’s on tables were cardboard funnel contraptions for women to use to stand at a urinal in the tented area!!!!! The idea of this is to speed up the normal ridiculous queuing for loos that normally goes on, by allowing several people to have a pee at once – well call me old fashioned but I feel a bit long in the tooth to start trying to pee like a man standing up. So like a few other women and calling on my time from running in the Sahara Desert I simply crouched down in the corner and peed like a normal woman! Less mess, easier and by the judge of things a lot quicker, if less hilarious. You might find it strange that I write about this, but it is one of the important aspects at the start of a marathon – as you need to pee far more times than can surely be normal…nerves mainly, and the hope that you empty your bladder so that you don’t need to go during the race. Anyways, enough of that! I sorted out my final bits of kit and as the sun was beginning to peep out and warm things up, handed in my kit bag whilst munching on a flapjack with all the claims of giving me enough energy to see me though any physical challenge I could dream up, and made my way to pen 4. Pen 4 is for the runners aiming to run a race finishing in a time of about 3.30 – 3.45. 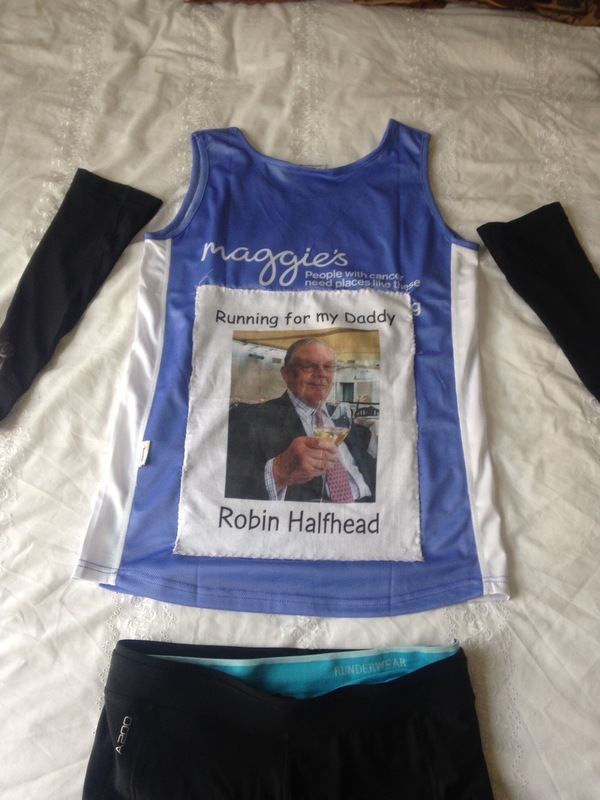 Yes, I know, ambitious – but when I decided to run the marathon, and had my place confirmed back in October, I had planned to toy with the idea of running somewhere round this time or even a PB. Fat chance now! That aside, being in a low numbered pen means you get over that start line in just a few minutes rather than the 10-20 minutes those back in pens 10+ take. I had a chat to a runner standing next to me from Brighton, dumped my horrible Third Space running jacket as I was now warm enough and shuffled forward with the masses as the start gun went, as we all gave a wave to the sky knowing that Tim Peake was setting of in space at the same time. It took me 2-3 mins to get over the start line, I hit start on my watch and I was off. Now I picked a nice steady pace that I didn’t feel was too fast, although it is tempting to keep pace with everyone around you, I know that would be disastrous as everyone around me was setting off at their intended sub 3.45 pace and I would have badly crashed and burned. I settled into a comfortable pace of around 8.45 minute miles and relaxed, and started to enjoy myself – the crowds were already out making noise, as were some wonderful bands, people playing music out of pubs, off balconies. I remember seeing a couple standing watching with their big dog (possibly a Rhodesian Ridgeback), and he was facing the oncoming runners barking madly at us – I like to think it was a positive bark! At about mile 3-4 I ran for a while with a lovely man (who’s name I have forgotten) chatting about the horrors of cancer and why we were both running. It is a crowded race beyond belief and there is quite a lot of jostling the whole way, elbows being nudged, and I was amazed how many times someone would catch my heels. I might sound a bit snotty here but my personal opinion in the London marathon is that mobile phones and possibly music devices should be banned. I think there is nothing more annoying than someone having a phonecall whilst in the middle of a race, and those listening to music, well not only are they missing all the wonderful atmosphere of the crowd and snippets of conversation going on, but they are also oblivious to what is going on around them and cause half the jostling. Gripe over! Rounding the bend to the Cutty Sark is one of the most wonderful moments of the race, you hear the noise of the crowd grow like some sort of hungry monster and the sun was shining making the old boat look resplendent in all its glory. If you are feeling good at this point, and I was, it is elating and almost puts an extra bounce into your pace – almost! Soon after that hitting the streets in South London through Surray Quays and Rotherhithe I began to focus on wondering where I might see some of my supporters – I was hoping to see my niece Matilda somewhere between mile 7 and 10, and was scanning the crowds as much as possible, but it is tough, as I was also concentrating on working things out like when I was going to have my next energy gel, listening for when my name was shouted out, and simply keeping a steady pace glimpsing down at my watch every so often. My watch was throwing me off a bit, as I told me I had reached each mile sooner than I had, the GPS seemed somewhat off, it would bleep the mile which would be at about 100-200 metres further on, and this distance increased substantially witch each mile – the relief was that it seemed to be the same for quite a few people judging by the beeps you could hear all going off at similar times. Suffice to say I missed Matilda, and she missed me 😦 still I knew she was there and in my head heard her yelling. I think at this point around mile 9 I was overtaken by a man dressed as a rather large strawberry!! Water stations are a bit of a hazard with other runners suddenly slowing down, sidestepping across you, arms thrust out grabbing the bottles from the wonderful volunteers, and then the discarded bottles which are still quite full being inadvertently kicked, exploding if they are heavily trodden on, thrown badly – just one of the obstacles alone the way, they at least don’t eject sticky liquid like the lucozade stations! I took on water at every other water station, going by my desert method of little and often, keeping hold of my bottle until it was about half empty before getting rid of it. Tower Bridge was approaching as my 2 hour mark approached. I looked out for my friend Lin and her family but again missed them, the noise of the crowd as you approach Tower Bridge is even louder than the Cutty Sark and again the sun shone out brightly as I turned the corner… The colours of all the charity banners and balloons are fantastic, and you feel incredible as you head over the bridge, the noise of the crowd so loud that names are indistinguishable and I found it quite emotional, and had a huge boost as I ran past the Maggies Centres cheering team just on the north side of the bridge before turning right to head out East. So I had missed Matilda, and Lin & Co….and I wasn’t expecting supporters on the way to the Isle of Dogs or around Canary Wharf. They are quite long miles, and I began to focus.a bit on my legs and how I was feeling, reaching halfway at mile 13.1 I was aware that I had only 3 more miles to go before I reached the distance of my longest run and I was beginning to feel tired. A Gandalf ran past me at this point complete with pointy hat and staff – I could have done with some of his magic! But you find boosts in strange places and from odd things – one being spurred on from this point every time I passed someone who was already walking and looking in trouble, another being amused by a rather bizarre group of Morris Dancers on the side of the road! The bands along the way are simply brilliant, loud with brilliant beats boosting your rhythm & pace – but Morris Dancers!! The miles through the Isle of Dogs and Canary Wharf are tough especially when you are heading out that way and towards sites like the O2 arena, you just continually feel like you are going in the wrong direction. When I have run previous races in the Sahara I apparently sing to myself although quite loudly according to other runners. 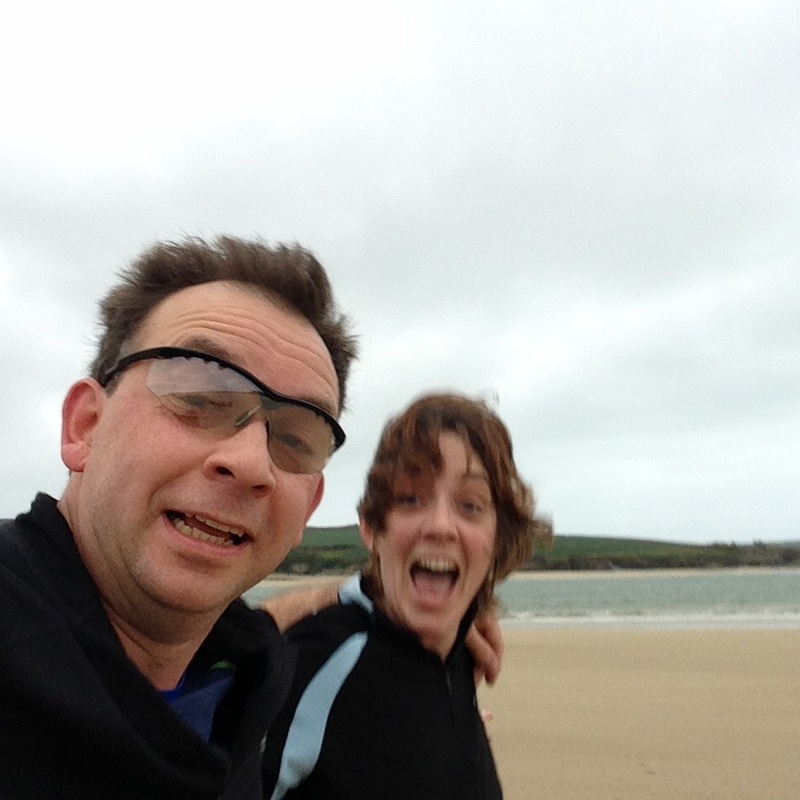 Instead of singing during those tough miles from about 14 to 20 I let my mind drift off to the Sahara desert or the cliffs in Cornwall remembering particular stretches and try to imagine that is where I am running – it works for a bit during each mile, distracting from the longing for each mile to go past. I also imagined the frantic communication going on between my family as they followed my race number online each time I went over the 5km timing markers – and as I approached mile 20, I admit I was beginning to fade a little as my muscles began to feel tired and a tad tight, I slowed down feeling a bit low, wondering if I was going to spot anyone in the crowd. I decided to chill for a bit and walk to mile 21 where I was joined by an American girl with very heavy looking fairy wings…we chatted for a bit and then when mile 21 approached we both began to try and run again. I was just getting back into the rhythm again around 35km when I finally saw one of my brothers, James and launched into an emotional bearhug as seeing him gave me a big boost – he said the others were just up the road. Now just up the road can have many interpretations, and to my mind it seemed quite a long way up the road before I spotted Nick, Rita & Bertie just before the underpass to the Embankment. They had set me a challenge, and were situated on a high raised bit of road so I had to jump up to be enveloped in a big hug and lots of encouragement before gingerly “jumping” back onto the road and setting off again with more boost in the system and the knowledge that Catherine & George were just up ahead in amongst the wonderful crowd that lines the Embankment. I was flitting from running to walking as it was becoming increasingly hard to maintain a consistent pace. Somewhere between mile 25 and 26 I saw my sister Catherine and nephew George and had an emotional hug, both me and Catherine crying. The last couple of miles were emotional as in my head I started to see and hear my daddy…the crowd were amazing as I kept hearing my name and the words “you’re nearly there, it’s just around the corner, keep going”. As I rounded the bend I scanned the crowd as much as I could for my ridiculously tall nephew Luke, my little niece Emily and Mummy but the marathon gods were against me and we missed each other, and then it was the home straight to the finish line. That stretch of the race where you feel like you are an elite athlete sprinting for the line – in reality it is quite the opposite, but I did look to the left and in the media area I saw Sebastian Coe and waved as if I knew him – I think he shouted “”Go on Harry”, but I may have been delirious at that point! And then I was over the finish line and suddenly it is all over. The emotion at that point is almost too much to describe, I burst into tears of joy, sadness and relief…the race Marshall looked a bit worried but I smiled and then had the medal put over my head and felt like a gold medalist. I did it Daddy, in under 4.30, and I missed you every step, but as I went to meet my wonderful family and get the biggest hug off Mummy I felt like I had the biggest smile – everyone who crosses that finish line is a winner, you see all of humanity in the marathon and supporting the marathon, there is no other event on the planet that creates such an inspirational atmosphere. It is said that when you cross the finish line your first thought is Never Again…well my. thought is bring on the next one. And, of course a big thank you to everyone who supported me, sponsored me and sent me messages of encouragement – you have no idea how much you helped me get across that finish line. And well done to all my fellow runners, you are all one in a million, and my condolences to the family of Captain David Seath who died. 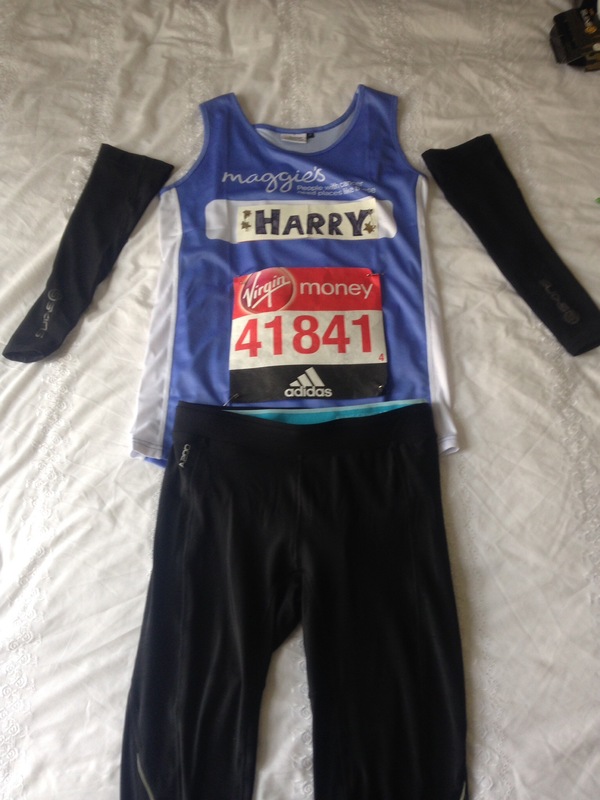 London Marathon….one day to go…. So here it is…the London Marathon 2016. This time tomorrow, depending on how smoothly the start goes, I will be at least 3 miles into the slog, calming down the adrenalin, bustling in the mass of other runners, smelling that bizarre smell that only comes at the start of a race – one of sweat, nerves, adrenalin, – hearing the loud clatter of 1000s of feet hitting the Tarmac amidst the continuous noise of the crowd as we head out through South London towards Cutty Sark and the Tower. My niece Matilda is going to be somewhere I hope in those first 10 miles – and I have a sneaky suspicion that my beloved friend Lin with family in tow will be relatively vocal as I turn right to stumble across Tower Bridge, after that I think the East End miles are going to be waiting to get back to the Embankment end of things were I am expecting my sister Catherine’s whistle to be defeating all those in her vicinity. I’m not sure where Nick, Rita, George, Emily & Bertie are planning on shouting, or Luke & James, but I’m hoping one or two of them will be hanging out with my wonderful Mummy who is going to be positioned in that last mile somewhere, channeling Daddy’s vocal chords to shout me down the Mall in what always feels like a Usain Bolt like sprint, but in reality would probably be faster if I were doing the sack race! And broke my right wrist, breaking the distal radius and chipping the bone. The next day I headed off to the wonderful Cape Town for the 2nd Test Cricket match between SA & England, where I had hoped to do some beautiful early morning runs along the coast. This was not to be, but the company & cricket more than made up for it. Coming back to the UK with an arm in a heavy cast for 6 weeks did not really mix well with going for runs longer than about 4 miles as it began to make me run a bit lopsided – not ideal over 26 miles! To add to the frustration of this was the mix of becoming single again and struggling with my job and general London life. The day my cast was cut off I felt was going to be so positive and I picked up my training, and felt along with my runners in my running club at my gym were I used to work that Spring was on its way. Not to be so…the next set back being “let go” from the Third Space half an hour before teaching my last class…12 years of dedication and slam – nothing. The new “Third Space” brand has no place for passion, loyalty and dedication. It left me a bit out on a limb and a bit desolate and not remotely like running. 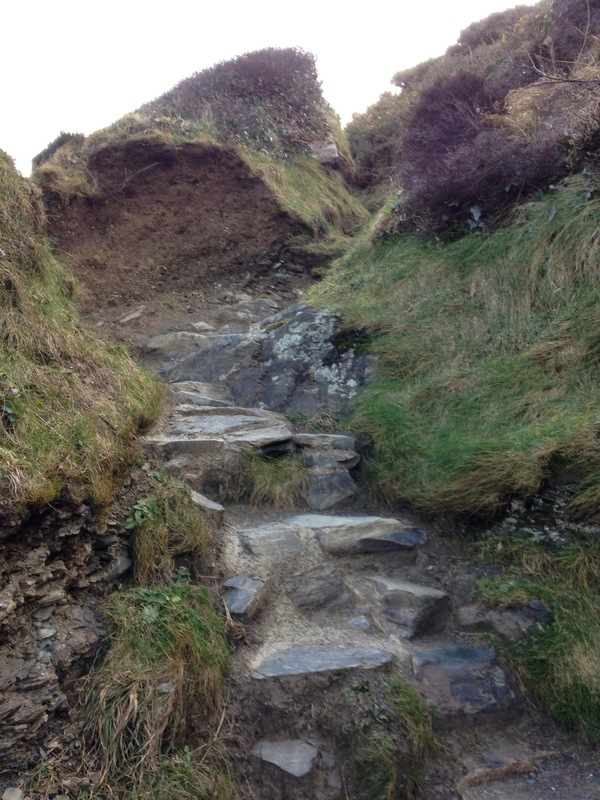 A week later in Cornwall again, I managed to break a toe (falling down stairs this time). Added to all this was the constant feeling of missing my dad. I have never experienced grief before and it is a tough cookie to get used to. I know that there are thousands of us out there running for someone we have lost tomorrow and I am not the only one. It is a tough mindset to deal with at times and the more I think about the race tomorrow the more mixed my emotions become – when I have run for a cause in the past it has always been for a cause I believe in such as improving hospital conditions in the Queen Elizabeth Hospital in Malawi, or the World Wild Life Fund, it has never been for such a personal cause. I know that I am running for Maggies Centres – but it is the fact that I am running for my Daddy that seems to make it so hard as I keep remembering past races: running down the Mall and hearing Dad’s voice coming from the grandstand seats where he & Mummy and Luke & Matilda had managed to cadge some seats, turning the last corner in Dublin and seeing him right in front of me bellowing for all he was worth, simply just hearing his English voice somewhere in the German crowd in Berlin, and always getting the biggest hug at the end in Cannes. I know he will be there, probably standing with my Mummy who I know this will be equally emotional for, as coming to watch without him for the first time. But I will miss him and running on emotion is tough – but don’t worry dad no matter what – I will cross the finish line…I have to, we have a table booked at your favourite restaurant Mr Buckleys! So all that there is left for me to say is a really BIG THANK YOU to everyone for their messages of love and support and to all of you that have sponsored me – I can’t tell you how much it means to me, every single one of you is making a difference, not just to Maggies, but to me as each one of you will help me plod through the agonising last few miles. Thank you. And good luck to everyone else that is running tomorrow remember the words of the great Emile Zapotek: “If you want to win something, run 100 metres. If you want to experience something, run a marathon.” Tomorrow is going to be an experience, enjoy every step.